The Ekiti State Governor, Chief Ayodele Fayose, has said no one can extort him over his criticism of the Federal Government's treatment of the agitation by Nnamdi Kanu and his followers in the Indigenous People of Biafra (IPOB). He additionally stated that he will keep on speaking out against foul play distributed to anyone or group in any piece of the country. He said this on Sunday evening while at the same time featuring on a radio/TV program in Ado-Ekiti. In a statement by his Chief Press Secretary, Mr Idowu Adelusi, on Monday, the governor said leaders of the All Progressives Congress (APC) in the state who blamed him for supporting IPOB were underhanded, as well as just left on shoddy shakedown that flopped woefully to accomplish any outcome. "We can't all be cowed. The militarization of Nigeria, being seen now must be compared to 1984 when General Muhammadu Buhari was military Head of State. "Slaughtering individuals in the Southeast since a few people are agitating isn't right and I ask why none of our alleged human rights activists is talking. "Herdsmen have sacked an entire group in this country, has anybody been captured for every one of the killings by herdsmen? "On the off chance that since I am talking against the wanton killings being finished by the military in the Southeast, the APC is stating that I'm financing IPOB, would i say i was the one subsidizing the general population of Southern Kaduna when I censured the killings there? Is it safe to say that i was financing the Agatus in Benue State when I denounced their killings by Fulani herdsmen? "Was I subsidizing the Shiite Muslims when I censured the killings of El-Zakzaky followers in Zaria?, he inquired. 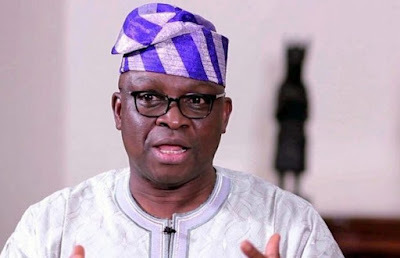 On late accomplishment by the state in the instruction sector where it started things out again in the National Examinations Council (NECO) exams, Fayose noticed that the state's investment and duty in the sector were paying off. He opined that training was not quite the same as infrastructural improvement, and that whoever neglects to invest in kids' instruction would wind up squandering his life. "In 2003 when I came the first occasion when, I met training in a state of a shamble. We were number 35 in WAEC at that point and I endeavored to enhance the circumstance before I was expelled from office. "In the event that you don't place teachers in the driver's seat in training, the final product will be disappointment. We have agreed teachers their merited regard and we don't interfere in their undertakings. It is not our business who progresses toward becoming NUT chairman. "Consistently, we observe Teachers' Day with pomp and reward best teachers with new autos. We have not come here to play politics with the instruction of our kids and I need to guarantee that one year from now as well, we will start things out. "My deputy that I have received as my successor is the one accountable for training and he has done well. I praise every one of us in Ekiti, particularly the teachers, for this accomplishment and by the grace of God, we will manage it," he guaranteed.